Home » Uncategorized » Searching for a fun, good-paying job in a growing industry? Look no further than this budding field—literally. 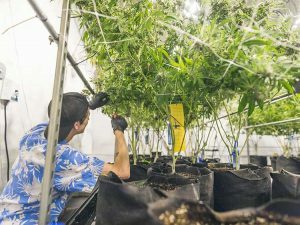 Another study has even higher (forgive the pun) job numbers: By 2021 the cannabis industry is expected to create 414,000 jobs in the U.S., according to an ArcView study. 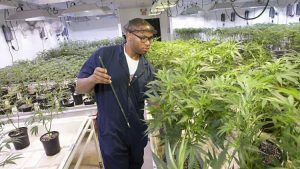 Cannabis jobs are multiplying as more states legalize recreational marijuana. California began sales of legalized adult-use cannabis on January 1, 2018, and customers lined up in droves; one dispensary alone sold $30,000 worth of product by 1:30 in the afternoon on New Year’s Day, Marijuana Business Daily reports. What you’d do: During harvest season, bud trimmers are responsible for cutting marijuana plants by hand. Trimmers manicure the plants to remove all the excess foliage and trim them down to the buds. Bud trimming is a great entry-level job for people looking to break into the cannabis industry. What you’d do: Derived from “bartender,” budtenders serve on the frontlines of the industry by working face to face with customers at dispensaries. “We call them consultants, since they guide customers through the process. What you’d need: For this job, you’ll be required to have working knowledge of cannabis products as well as all current rules regulating retail and medical marijuana. Budtenders must also be sociable to ensure the customer has a good experience. What you’d do: Extraction technicians—also known as concentrate makers, or extractors—take marijuana plants and turn them into hashish, oils, and other concentrates. Because they apply scientific techniques and procedures in labs, these professionals have to be detail oriented and precise. What you’d do: Dispensary managers oversee the daily operations of the cannabis retail shop. Their responsibilities include everything from interfacing with vendors and law enforcement to managing inventory and dealing with product returns. Dispensary managers hire, train, and manage budtenders, and ensure that only the best and safest product is being sold.